Night guards are coverings worn over teeth, and often used to protect teeth from injury from clenching and grinding your teeth at night. There are two different types of night guards we suggest. Boil and bite night guards can be bought at many sporting goods stores and may offer a better fit than stock mouth protectors. The “boil and bite” mouth guard is made from thermoplastic material. It is placed in hot water to soften, then placed in the mouth and shaped around the teeth using finger and tongue pressure. 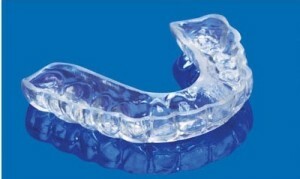 Custom-fitted night guards are individually designed and made in our office. First, you will have an impression of your teeth made. Our dental assistant will then make a model from that impression and fabricate a night guard for you. Your night guard will be ready to pick up the next day. Your night guard will fit on your upper teeth. You will wear it at night when you sleep since this is when most people clench and grind their teeth. It is important to wear a night guard if you do clench and grind to help protect your teeth and not cause any damage to them.